The OceanObs'09 Conference brought together more than 600 scientists from 36 nations, supported by 99 Community White Papers and 47 Plenary Papers, to build a common vision for the provision of routine and sustained global information on the marine environment sufficient to meet society’s needs for describing, understanding and forecasting marine variability (including physical, biogeochemical, ecosystems and living marine resources), weather, seasonal to decadal climate variability, climate change, sustainable management of living marine resources, and assessment of longer term trends. The Conference Proceedings were published in 2011 and printed in 2012. 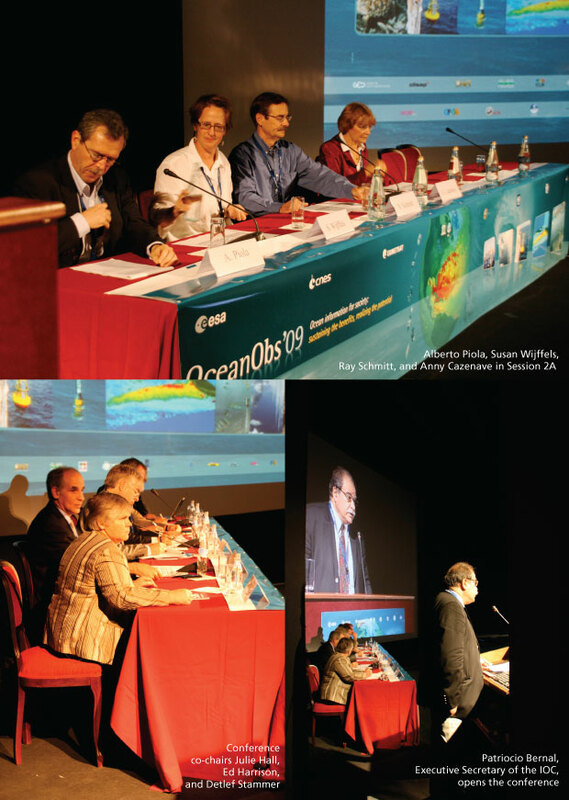 The Framework for Ocean Observing called for by the OceanObs'09 Conference Statement and adopted by the Global Ocean Observing System is meant to guide the ocean observing community as a whole to establish an integrated and sustained global observing system - one that includes ocean physics, biogeochemistry, and ocean biology and ecosystems, and addresses the variables to be measured, the approach to measuring them, and how their data and products will be managed and made widely available to modeling efforts and a wide range of users.